Today Selma In The City turns one. I am so grateful to all my readers and to all the wonderful friends I’ve made. Blogging has enriched my life more than I could ever have imagined. I am most grateful to four very special people who have been with me from the very beginning, who were reading my humble little blog when no one else was and who have continued to read and comment since then. Your support, feedback and generosity will stay with me always. I will never ever forget your kindness to me as a fledgling blogger. Meleah Rebeccah from Momma Mia, Mea Culpa. Meleah is a person who always has time for others. She truly is one of the warmest, kindest people I have ever met. And she’s funny to boot. Do yourself a favour and check out the hilarious movie she has made about her latest love affair. Thank you, Meleah. For everything. Thank you, Keith. Especially for the pieces about Stonehenge and for all the hilarious comments you have left on my blog. I would also like to thank my dear friend, Karen, from Ms Karen’s Place for her warmth, her honesty, her encouragement, and just for sharing her wonderful writing with me. I love hearing about her family. This is one of my favourite posts. Thank you, Karen. You are a kindred spirit. I mean it. And finally, a huge thank you has to go out to the hilarious Groovy from Groovy’s Ruminations. She has blue frogs, she has goats, she sings, she bakes the most amazing cakes but most of all, she has a wonderful family life that is a joy to read about. Please stop by and say hello. Thank you, Groovy. You are a very special lady. Congratulations Selma! I’ve so enjoyed reading your blog that it has become part of my bookmarked morning reading. And thanks, too, to my dearest friend, Ms. Karen, for turning me on to your blog! I’m looking forward to another year of reading your brilliant stories and ruminations. How funny! 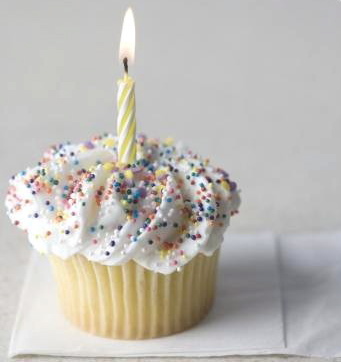 You and I have the same Blogiversary date AND we both used a cupcake as our graphic today! Congrats on the milestone Selma, well done! I have been blogging over two years first at Veggies…and then for the past 4 months or so, at My Poetic Path. It’s been a great way to get back to my creative writing pursuits that have been put on hold for too many reasons, for a long, long time. I also am so gratified by the incredible feedback and support I have received, at both blogs. I’m sure you can relate! You are in good company for a blogoversary this weekend Selma! Thought you might want to check out his blog too; I love it! After you blow the candle, can I please have the cupcake? Seriously, congratulations, Selma. You have been a joy to so many people, not only because of your amazing talent, but even more so, your ability to be a good friend. Many congratulations, Selma. It feels good to reach a milestone, especially the first. And I’ve seen this blog grow deservedly – and you blossom as an excellent writer. Happy Blogday to you! I think I started reading your blog about 8 months back, if I am not mistaken. I’ve enjoyed your writing and I hope you continue for as long as possible. Have a great week ahead of you. Happy, Happy Birthday, Selma In The City!! I, for one, am so happy to have discovered you – or was it the other way around? I can’t remember, but am grateful to have become a part of your blogging crew. Meleah is the best, isn’t she. Always there with a sweet or hilarious comment. Steadfast is what she is. Like attracts like, I’d say! Happy birthday! Blogbirth? Blogday? Anyway, yay, you! I can’t tell you how much your words inspire me and your friendship means to me. Here’s to more reading and writing! Dear Dear Selma, Hi hon! You are at the TOP of what I read, everyday. I think I met your lovely Blog–and YOU–through Poet With A Day Job’s Blog!Keep up the great work! Hugs & Peace to You & Yours and HAPPY BLOGGING!!!!!!!!! Happy Bloggerversary,Selma. Reading your writings here and your comments on other blogs is delightfully inspirational and inspirationally delightful. Thanks, David. I was wondering what to do with mine a couple of months ago … I thought of posting a slide show called BOPOW … Best of ‘Pic of the Week’, but I’ve been so busy lately. But, I’ll keep the idea in mind for around the New Year. GERALDINE – Oh, I can definitely relate. I didn’t expect to come into contact with so many like-minded people when I first started blogging. It really has been a blessing! CHRIS – I feel the same way about you. It is a true honour to have met you! ANTHONY – well now I am beaming. You are one of the sweetest people in the blogosphere. I am so lucky to have met you. ROSHAN – well the feeling is definitely mutual. You are a terrific person. EPIPHANY – I am so glad you to have met you too. It has been wonderful getting to know you. And Meleah – she is such a great person. I don’t think I’d still be blogging if it wasn’t for her! LISA – I did meet you through PWADJ. Amazing, really. It has been such a pleasure getting to know you! CRAFTY GREEN – thank you so much. It’s been fun! TRAVELRAT – we definitely deserve some kind of stripe. I didn’t expect to enjoy blogging so much or to feel so gratified. It’s been very, very cool! happy blogaversary selma,, it is i who should be thanking you for all of your wit and creativity over the course of the past year… thank you ever so much for being a part of my blogging world…..
Congratulations! Now I will always remember your blog anniversary because it falls on the same day as my brother’s birthday. Your blog is wonderfully writing and always compelling. Happy Birthday, dear blog, Happy Birthday to You! Now pass the cake, please. Seriously, Selma, congratulations on this Blogiversary. I couldn’t agree with you more – blogging is fab. You meet such nice people! Happy Blogiversary to you! I always enjoy coming over here; your personality and talent shine like a beacon accross the ocean all the way here to the USA. I’m looking forward to more years of brilliant writing from you. Happy Bloggy Birthday, Baby! I can’t believe it’s only been a year! Happy Blogiversary, darlin! It’s been a splendid, well-written year. Thank you for giving me (ok, I’ll share… ALL of us) such wonderfully-written posts and insights. So much good stuff, it’s hard to believe it’s only been a year! Thanks also for the mention. You are a wonder and a great friend. I’m so glad we met at Willow’s Bar. You’ve made life that much better for being in it. Thank you sooooo VERY much for mentioning me and my little Apple Video! You are such a great friend. I am thrilled to have you in my life. Congratulations! And I thought “I am one” was a reference to the Who song by the same name. INGRID – thank you so much. I am glad to be in such good company as your brother’s birthday. It has been great getting to know you. BONNIE – how lovely to hear from you. I hope you have been well. I must come and visit you. It has made my day to hear from you! PUDDOCK – the people you meet are what it’s all about. I love that video of Meleah’s too. I think I am also a candidate for an affair with my Mac. LOL. LINDA – oh, you are lovely. I hope you continue blogging for many years to come too. I am enjoying your writing so much! BRITT – it’s gone by so quickly. It has been a joy to meet you. I feel very fortunate. KAREN – Willow’s Bar should get an award of some kind. Look at all the wonderful people we’ve met there. My life is better for knowing you. You are such a special person. RICHARD – OMG, I cannot believe you got that. You definitely should be hanging out with my husband. That is awesome! OH I missed the party. Thank you for making me a better writer. You are one of my favourite reads. Happy Blirgthday Selma! I’m so glad I wandered over here one day to have a read. I also have you on my quick bookmarks and I always look forward to popping in for a visit. Truth be told, methinks your readers are getting the better end of the deal. Happy Blog Birthday!! Always a good time to reflect. DAOINE – well I love having you visit. Your comments are always brilliant. One day we will have to meet for sure. I would enjoy that! JONAS – you are a sweetie. Aww, thanks, Jonas! JASON – reflection is very important. I think it’s a good thing to keep on challenging yourself and growing, and to strive to be the best person you can. I always feel better for it. Thanks for visiting. You know, I was going to ask if your husband’s store has a web site that I might be able to buy a couple of cds from. I like to support the few remaining independent places out there. On Thursday night he is having an up and coming Aussie band play in the store. Their show will be broadcast on You Tube so I’ll send the link to you once it’s up and running. Typical me, always late to the party. Happy Blog Birthday you sweet thing. You know I am always behind in my reading but I do always get here eventually Selma. I wouldn’t miss reading your blog no matter how hectic life gets.